PBL Assay Science (formerly PBL InterferonSource) has been manufacturing and selling interferons, cytokines, antibodies, single-analyte assay kits, cytokine multiplex ELISAs, and related reagents since 1990. PBL has changed its name to reflect the company’s growth beyond interferons to a broader range of assay-related products and services. In doing this we have not abandoned our core competency in interferon: we have simply recognized that our research, our products, and our services have moved beyond interferon into other cytokines, biomarkers, multiplexes, and biological materials. Our new name signifies a renewed focus on partnering with researchers to solve their most difficult problems; our goal is to grow and expand the company’s reputation as a provider of high-level Assay Science to researchers around the world. To learn more about what PBL Assay Science has to offer, please visit our website at www.pblassaysci.com. Please contact Axxora Technical Service for pricing and information on PBL’s bioassay testing services. PBL products and services are not available from the AXXORA Platform in Japan. Interferon-beta (IFN-β) is a tightly regulated, early response cytokine primarily responsible for controlling viral infection. Conversely, IFN-β aberrant expression may be associated with inflammation and autoimmunity. More sensitive assays are needed to investigate the physiological relevance of low levels of IFN-β that may be present before viral infection or autoimmunity is observable. A constant challenge in interferon immunoassays is to consistently quantify the amount of IFN-β presence in serum or plasma without interference by heterophilic antibodies, clotting factors, and/or serum proteins. Interferon spike-recovery tests with six serum samples where known amount of IFN-β was added to the sera. The green line represents the average results from another manufacturer’s kit minus one false positive. Average results from PBL’s VeriKine-HS™ Human IFN-β Serum kit (orange line) demonstrates a superior dose response compared to the competing kit. 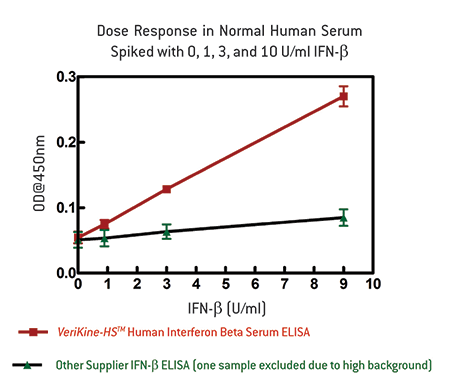 The Verikine-HS™ Human Interferon-Beta Serum ELISA kit (Cat. No. PBL-41415-1) by PBL Assay Science is designed to provide researchers the ability to accurately measure low levels of human IFN-β in human serum or plasma samples. Accurately measures IFN-β in human serum, plasma, autoimmune disease serum, and cell culture supernatant. 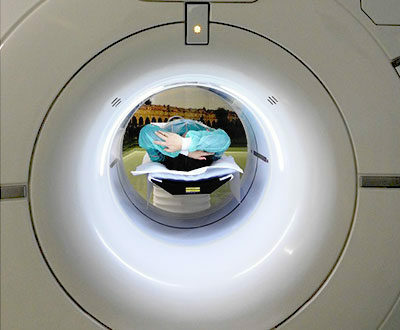 Detects IFN-β levels as low as 1.2 pg/ml. High signal-to-noise ratio with minimal interference from serum heterophilic antibodies. Does not cross-react with human IFN-α, IFN-λ, IFN-ω, IL-6; nor with mouse IFN-α, IFN-β; nor with rat IFN-β. Excellent % CV (<8%) to ensure data reproducibility. 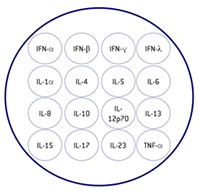 Introducing PBL Assay Science’s VeriPlex™ human cytokine multiplex ELISAs for measuring Type I, II, and III interferons and other key inflammatory and anti-inflammatory cytokines. Through its laboratories in New Jersey, PBL Assay Science provides assay services to expedite your research and development work. 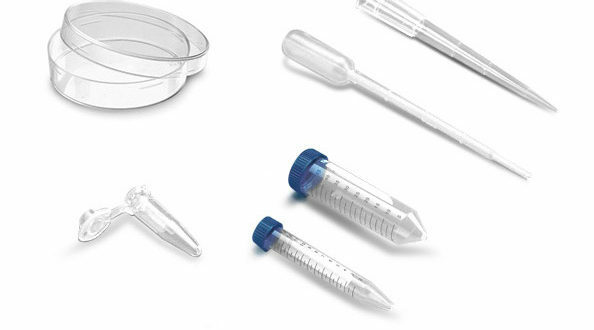 PBL offers sample testing and screening services, assay design and development, assay optimization, protein biophysical characterization, as well as custom assay and reagent development. Sample testing and screening includes bioassays such as cytopathic effect inhibition assays, neutralizing antibody assays, proliferation/anti-proliferation assays and cytokine secretion assays. PBL also offers analyte services, including single or multiplex ELISA and Singulex® assay services. In addition, antibody services including biophysical characterization of ligand affinity, kinetics and epitope binning are available.